Carribean Tile -2 Piece Set 2 Custom Framed Prints. 100% and created to last. Individually printed and framed by hand to very high standards. Printed and inspected one at a time utilizing the latest archival UltraChrome Giclee inks Consisting of 2 Total Framed Pieces Each measuring 16''x16'' x .75'' deep Each Piece is Individually Framed Acrylic Glass Each piece includes hanging accessories and is ready to hang. You need only to apply an anchor to the wall of your choice. Love the prints. Hate the frame. Description said frame was silver and material is wood. The ones I got are black and not wood. Don't go by a picture on the web site. I was very surprise at how low quality this product is considering the price. Each picture including the frame weighs almost nothing and is constructed of cheap materials. I love these matching photos. They are a great addition to my home. I love the blue and brown in my bathroom. They are not as big as I thought, but still they look great. 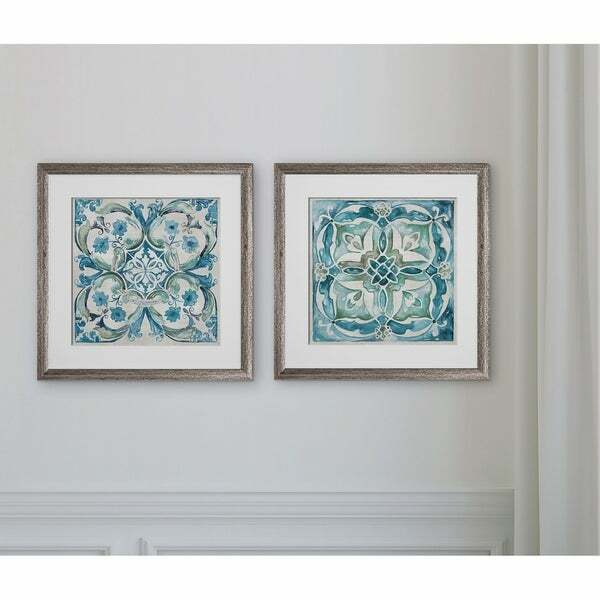 "Caribbean tile 2 piece set wall art is nice but I don’t know what color the frames are. I have it in my cart but need to know the frame color first. Could u help with that?"